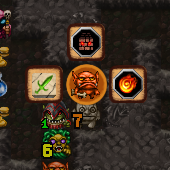 This week’s update comes with yet another interface tweak for in-dungeon combat: left-clicking on an opponent and dragging the mouse cursor off its grid tile will produce a quick menu similar to the recent pop-up system we’ve been testing out. Instead of a separate control mode, this integrates itself with the rest of the combat control options (standard clicking and custom selection panel), providing users with another avenue of flexible control while being as smooth and unintrusive as possible. The pop-up / normal combat toggle option via the in-game menu has been changed to a button layout option for this scheme, and for the time being the option will be changed randomly on new runs so that players can get a feel for both formats. Let us know what you think! Changed badge notation to 10 + 1 for vicious badge. Fixed a bug where dragging inventory items no longer showed the item. Added click-drag pop-up menus to enemies/player/walls. Clicking anywhere in the kingdom will close any open building panels. Speech bubbles should no longer appear above loading panels. Explorers’ Guild classes no longer appear greyed out when returning from a puzzle. Fixed a bug where items from active backpack slots could enter the shop pool.